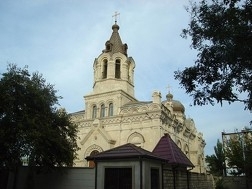 Baku, November 15, Interfax – The establishment of an Orthodox religious and cultural center as part of the local diocese of the Russian Orthodox Church in Baku confirms the Azeri people’s tolerant attitude toward other faiths, Azerbaijan’s Ambassador to Russia Polad Bulbuloglu told Interfax on Friday. “I, as a person who represents Azerbaijan in Russia, believe that such an event is hugely important. It once again proves the tolerance of the Azeri nation and the Azeri authorities,” he said. Azeri President Ilham Aliyev’s personal participation in the ribbon-cutting ceremony for the center was a “one-of-a-kind occurrence”, the ambassador said. “Religion is separated from the state authorities in our country. But the state helps [religious institutions], should such a need arise. A land plot was assigned and the center’s building was constructed within a short period of time. All these circumstances serve to highlight the state’s attention toward religion. It is highly important because Baku has always been an international city,” he said. This tradition endures, and elderly people teach the youth to respect representatives of other faiths and live side-by-side with them in friendship and peace, the diplomat said. “If you treat representatives of other faiths with respect, you will be treated by them with respect as well. That is why this factor is highly relevant and meaningful,” he said. The center, which appeared following instructions from the Azeri president, accommodates an Orthodox Sunday school and will host baptisms and other religious ceremonies.